This time, well, I really wanted to get rid of some of extra fluff . So I grabbed one from her. I was determined to do it right & follow the plan. I started on a Thursday. 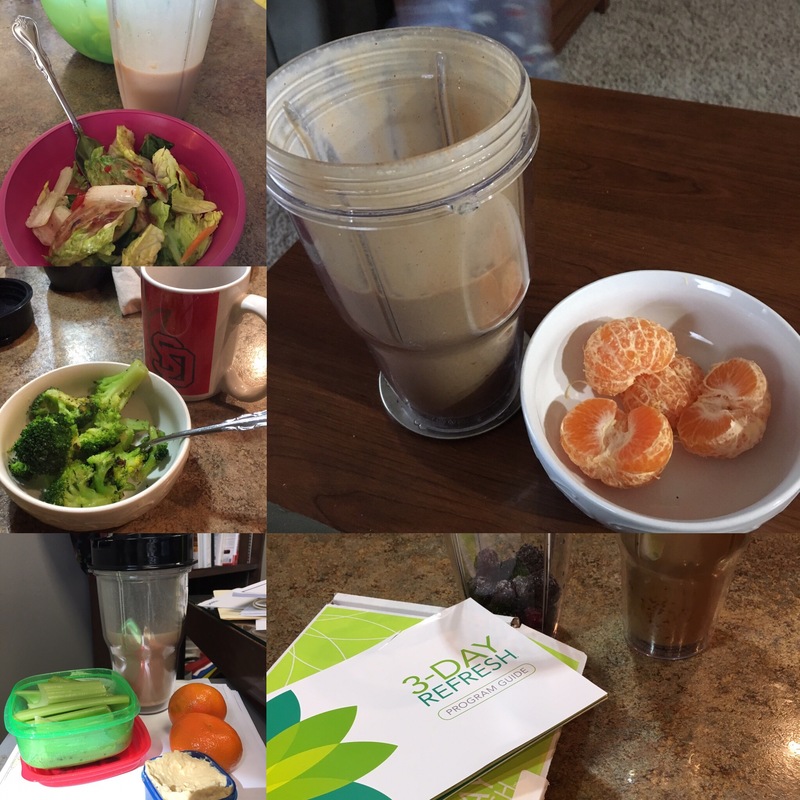 The 3 Day Refresh is basically 3 days of shakes, a daily fiber sweep & a vegan diet. I did sneak in a taste of cake at work (worth it) and one or 2 pieces of chicken that got in with the stir fry veggies last night. The hardest part was staying away from meat/dairy while at home. I prefer my Shakeology with milk or almond milk so my morning shake felt like it was missing *something. * I also enjoyed the vanilla fresh shakes after adding about a tablespoon of sugar-free salted caramel syrup. Still not a favorite, but at least I didn’t feel like I had to choke it down. This is not something you can do on a whim and it’s not meant to be done long term. It’s a quick jump start (or restart). It only requires a few days of discipline and some planning. You need to be sure you have fruits & veggies in the house. I used frozen veggies as that is what we purchase most. The instructions do not recommend using canned (nor do I), but I think frozen veggies are a good option to fresh, especially if, like me, you do not like going to the grocery store on a daily basis! Breakfast: typically would have my cafe latte shake with frozen strawberries (or would eat the strawberries separately). One morning I had some Halo oranges. Lunch: Vanilla fresh shake. One day I had celery & hummus. Another day I had a mixed salad with a raspberry vinaigrette. Afternoon snack: celery & hummus — let’s keep it simple right? Evening meal: 2 nights I had roasted broccoli as it was easy to make along side what everyone else was eating. The final night, I made stir fry and picked out *most* of the chicken. I also drank a LOT of herbal tea. Results: 8 inches gone (around 3 inches is typical)! 2 pounds gone! Bye-bye fluff!! I would definitely do this again. 3 days of vegan isn’t difficult, and the best part is you can have some healthy fats (I had sunflower seeds, hummus and garlic olive oil for the roasted veggies). It was good for me to discipline myself for a few days. And breakfast of pancakes & bacon with coffee this morning was AMAZING!